A delightful mix of original tunes and traditional Irish, Scottish, and Colonial songs from the 18th and 19th centuries. Brigands' Folie is an acoustic duo playing living history encampments since 2005. We strive to educate the public about the lives and stories of 18th and 19th Century settlers, pioneers, soldiers, and sailors through music of the period. Thank you for buying our CD! Karen Garland provides vocals and guitar on all tracks and bodhran on a few. She brings a lifetime of experience in period music mixed with a love of history and unique songs to this project. Jake Weller provides vocals, mandolin, and bass on all tracks along with piano, special effects, and various drums on select tracks. He brings a lifetime of classical and jazz piano, percussion, music theory, and performance to the mix. 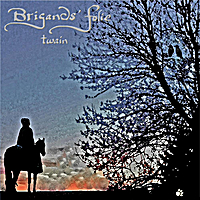 All original, copyrighted music and arrangements on this CD are the product of collaboration between Karen and Jake; the rich blend of practical and theoretical that is Brigands’ Folie. Yellow Jack is a lively tale of the loss of an English sailing vessel and her crew to yellow fever. We draw strongly on our knowledge of naval traditions and sailors' lives (and deaths) in the 18th century as we spin this yarn of an all-too-common foe in the Caribbean. As the ship’s surgeon searched for cures and preventatives to hold the “miasmas” at bay, the unsuspecting sailors were often swarmed with infected mosquitoes every time they approached shore. In Morgan le Fay, we share the tale of the Fata Morgana mirage, known around the world to cause flying ships and floating cities to appear before superstitious sailors. Caused by light refracting through alternating warm and cold air on a clear morning, this optical phenomenon has long been attributed to the witch Morgan le Fay, who predates Arthurian legend. Continuing with our macabre theme, Dark Rider is another original tune written concurrently with Yellow Jack. Here we spin the tale of a highwayman encountering a mysterious woman alone on a black horse. While thinking he’s found easy prey, she is in fact a Kelpie. He takes her hand and is enslaved for eternity to do her bidding. In the final verse he seeks salvation from a woman with golden eyes on a white horse, only to find his fate unimproved. Die Lorelei melds two German legends about an enchanting witch who steals mens’ hearts and a well-known siren on the Rhine with the same name. We struggled to find a tale that told of the siren on Three Knights Rock combining her origins as a witch and her transformation into a siren, so we wrote our own and set it to a Platt-Deutsch folk tune. We enlisted our friend Michael Kleiske to provide a German translation for the final chorus. The Christmas Waltz is our latest instrumental composition, written during the Holiday Season. A simple melody floats along on a powerful undertow provided by the haunting beauty of a phantom cellist. We hope you continue to enjoy our music as much as we enjoy making it!